Whats the basic reason behind placement of these deities? What is the basic reason behind placement of deities in the three layers in the Dakshineswar Adyapith temple? The Garva-griha of the Adyapith temple has three altars, one atop the other, are like stairsteps. 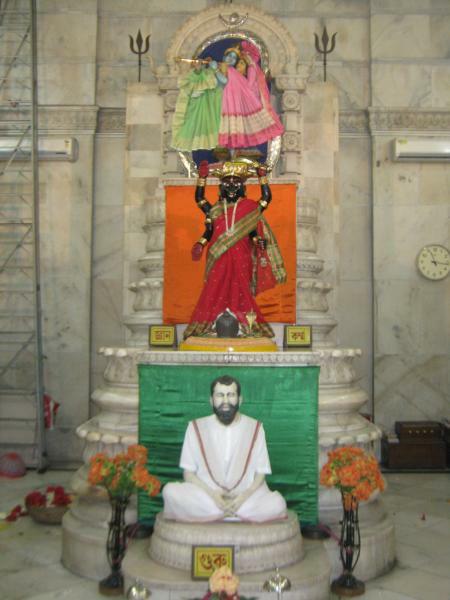 On the bottom altar is a murthi of Sri Ramakrishna, with the word "Guru" inscribed nearby. On the middle altar is a replica of the murthi of Adya Ma found by Annada Thakur in the Eden Garden. This murthi is made of eight metals. Nearby is inscribed "Jnana and Karma." The topmost altar is adorned by the murthis of Radha and Krishna, known all over India as the Divine Couple. They are encircled by the sacred syllable om, and at their feet is inscribed the word "Prema." Thus love is the foremost virtue and the clearest path to God. So one has to get guidance from Guru first, and proceed on the spiritual path by nishkama karma ( Upasana and service to all beings) and studying the scriptures maintaining austerity. On this path, the grace of Mahamaya is crucial, as She is tye one Who binds or liberates us. Finally one can reach the pinaccle which is Pure and Selfless Love. This Love is the 'panchanma purushartha' itself and this takes tye aspirant to God. God is Pranava (Om itekaksharam Brahman--Gita) Who is both Purusha (Sri Krishna) and Prakriti (Sri Radhika). Reference: https://www.adyapeath.org and Swapna-Jivan by Annada Thakur. Not the answer you're looking for? Browse other questions tagged gods temple . Is there an explanation behind the association of certain deities using a particular animal as the deity's vehicle? What is the story behind Dhooli Darsanam in Srisailam? What is the story behind Padmanabha Swamy? What's the reason behind the tortoise statue and the nandi statue in shiva temples? Did the people of Srirangam really fight a war ? Why can't we walk full clockwise in shiva temple? Why are nava grahas in a temple placed such? What is the principle behind Hindu deities having more than two hands and more than one head?